BLUE FROG ROBOTICS takes home the highest honor in the Best of Innovation Awards Product in Robotics and Drones category. 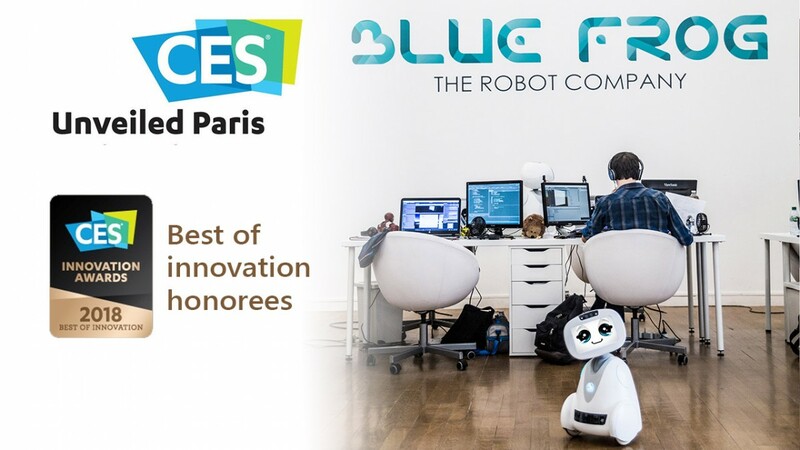 Paris— October 24, 2017 — BLUE FROG ROBOTICS today announced that it has been selected as one of the prestigious winners of the Best of Innovation awards for BUDDY, The First Companion Robot for all the family. BUDDY, A BEST OF INNOVATION HONOREE IN THE ROBOTICS AND DRONES CATEGORY. BUDDY is the revolutionary companion that connects, protects, and interacts with each member of your family. Behind his cheerful & sweet little face, BUDDY acts as your assistant, monitors your house, entertains your kids and interacts with smart home devices, among many other services. Products chosen as ‘CES Best of Innovation Honorees’ are the products that received the highest scores in their product category and are considered to have the most impressive technology. The ‘Best of Innovation’ title reflects innovative design and engineering in some of the most cutting edge tech products and services coming to market. The awards were officially announced today at CES UNVEILED in Paris by the Consumer Electronics Association (CTA)™. The award-winning BLUE FROG ROBOTICS product, BUDDY robot, will be on display at the world’s largest consumer technology tradeshow, CES 2018, in Las Vegas, on Jan. 9-12 2018. “We are thrilled to have our BUDDY robot recognized by this prestigious organization for its innovation, quality, and design.” said Rodolphe Hasselvander, CEO and Founder of BLUE FROG ROBOTICS. “The icing on the cake is that our BUDDY robot is named a ‘Best of Innovation Awards‘ as we believe BUDDY truly is the most full-featured and best-engineered companion robot in the market today. It’s also a huge point of validation for all of the incredible work we’ve seen from the BLUE FROG ROBOTICS team throughout the development process and the on-going support from our shareholders. We are excited to be recognized as leaders in the Robotics industry. Last but not least, this award truly shows our ongoing commitment to produce a breakthrough product that improves our lives and better our world”. Sponsored by the CTA, the producer of CES 2018, the prestigious Innovation Awards have been recognizing outstanding achievements in product design and engineering since 1976. Products are judged by a preeminent panel of independent industrial designers, independent engineers and members of the trade media, to honor outstanding innovative design and engineering in cutting-edge consumer electronics products and services coming to market across 28 product categories. BLUE FROG ROBOTICS was founded in 2014 by Rodolphe Hasselvander, former Executive Director of CRIIF (robotics lab). 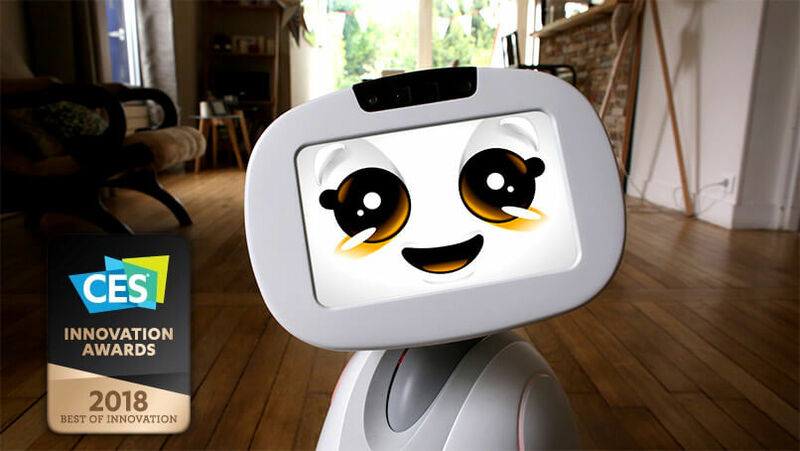 BLUE FROG ROBOTICS is the developer of BUDDY, a cute mobile, sociable and emotionally intelligent robot, designed as a companion for the whole family. BLUE FROG ROBOTICS designs and develops robots that are affordable for everyone and make life easier, safer and more fun. The France-based startup is focusing on the emerging market for personal service robots, which it believes offers as much potential as the market for personal computers in the 1980s and 90s.